After a couple of false steps along the way I was finally able to knit the red stripes. Not only that, the left front of the cardigan is now finished. I guess I could moved the yarn ends before taking the picture. Oh well, next time. 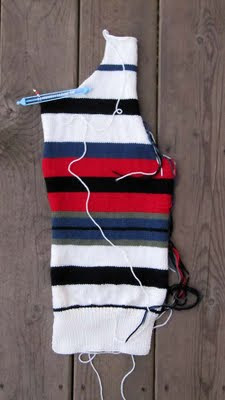 I've started the ribbing of the right front. I am loving this yarn. It's such a pleasure to knit with it. Speaking of red, I'm working through the red tape of getting settled in Canada after living in the US for 13 years. Last week I went to Canadian Tire to get my car inspected, a necessary step when importing a car that was purchased in the States. The first time I stopped in, on Tuesday, I was told that I needed an appointment, so I made one and came back two days later. Then, on Thursday, I'm told that I didn't have all the needed paperwork. Appointment cancelled, and I went to get the additional paperwork. Yesterday, Tuesday, a week later, I kept my new appointment and showed up with my documents and I was told that I needed yet another one. Why didn't they tell me that before? I had to call the dealership in Denver and they tracked down what I needed. My new appointment is this Friday but I'm going to stop in later today to be sure that I have all that I need. If this isn't wrapped up by the middle of next week I have to start all over again...getting new documents and paying new fees. I wonder how painful it would be to pull all my hair out?